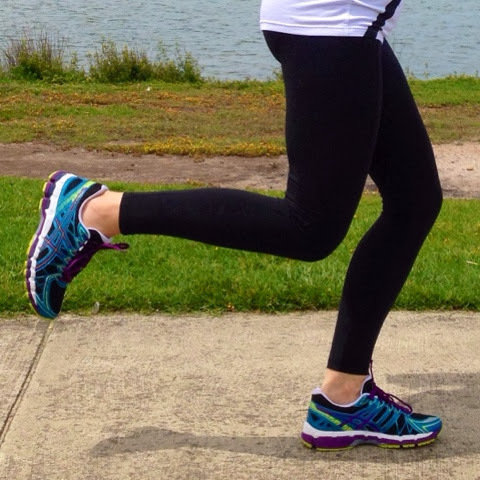 My 20 top tips for pounding the pavement like a pro! Jogging can be such an exhilarating form of exercise. Not much beats the rush of pushing your body to the limits, pounding the pavement and knowing you've got your heartbeat up to full notch! It's inexpensive, portable and can be done solo or with others - winning, I'd say! 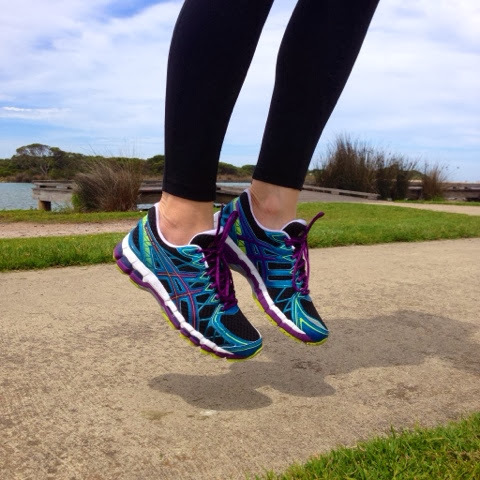 Super comfortable Gel-Kayano 20s make me jump for joy! You'll probably remember last month, that I went and got fitted for a pair of the new Gel-Kayano 20s - a range exclusively released through the Athlete's Foot - and since then I have not looked back. Without a doubt these would have to be the most comfortable shoes I've ever trained in and because I consider purchasing a decent running shoe to be an investment in my health, they've proven themselves time and time again in the month or so I've had them. But really, getting into running is actually a bit more complicated than just pulling on your ASICS and getting out there. There are certain things that you should take into consideration when preparing to take-up jogging as your exercise of choice. There are also some things to keep in mind while you jog as well as some important things to remember to do after your running workout. Whether you're new to the jogging scene, or a long-time runner, it's always good to refresh on some key points and check this out ... the Fitness, Food and Style Top 20 tips for Running. 1. Warm your muscles up for at least 5 minutes before jogging. Brisk walking and/or stretches should ensure you are ready to rock and roll! 2. Shorter steps landing on the middle part of your foot is less likely to cause an injury that longer strides landing heavily on your heel. 3. Steady, combo breathing through both your nose and mouth will give you higher oxygen levels than just breathing through your nose alone. 4. Wearing old or worn out running shoes is an invitation to injury. It's the internal cushioning more than the tread that you have to look out for and as a rule of thumb you should replace running shoes around the 500km mark or every 3-6 months. I'll definitely be returning to the Athlete's Foot for another pair of Gel Kayano 20s at replacement time, because I'm yet to have a shoe that's come close to the cushioning and support of these. 5. If you are a beginner - or even recovering from illness - alternate jogging with some brisk walking. You can decrease the walking time and ramp up the running time as your fitness builds. 6. Mix it up with personal challenges - these can be in the form of distances or times. Maybe even a new route to keep things interesting. 8. If your workout time means running in early light or on dusk, be sure to wear light colour tops or something hi-vis and fluro to be easily seen by traffic. 9. Try to limit your water intake during the 30 minutes before running. Having a belly full of liquid can be uncomfortable and lead to cramping. That said, be sure to take a water bottle with you. 10. Don't feel obliged to run every day of the week - having a break day and jogging 6 days out of 7 is actually recommended by exercise experts. 11. Remember that safety is important: carry a mobile phone, don't listen to music so loud that you are unaware of your surroundings and when possible jog in well lit and populated areas. 12. When you're a beginning jogger, the first few weeks will be the toughest. Embrace it! You'll find it does get easier! 14. If you're looking at running as a fat-burning exercise, you'll be pleased to know that it burns 28% more fat than cycling! Yet another great reason to pull on those trainers and get moving today! 15. Bonus points if you have access to a treadmill. On days where you can't get outside into the fresh air, treadmill running is just as good for you. 16. When going to purchase a new pair of running shoes, make sure you take the socks with you that you intend on wearing. It's likely that your feet are slightly different sizes so buy a pair that is most comfortable for the 'bigger' foot. 17. Be sure of your new running shoe purchase by taking your current pair with you so an easy comparison can be made about feel - cushioning and comfort - without having to rely on how you think the old ones feel. Good running shoes represent an investment, so you'll want the best possible pair in your price range. The Kayano 20s have been worth every cent of the outlay. 18. Don't be too hard on yourself about your running - although pushing yourself is great, running for personal exercise is not a competition or race. Listen to your body and enjoy it! 19. You've warmed up, you've run like a champ so don't forget to cool down at the end! Stretching your muscles after exercise is often overlooked but so very important! 20. If you're thinking of taking up running, but are yet to start, remember to get the all clear from your doctor. You could also consider seeking the advice of a professional to help organise a suitable running schedule to get you going. If you're a keen runner, what tips or advice could you add to the list above? I'd love to hear your suggestions and feedback in the comments.